Beyond the gateway is becoming a travel industry buzz word these days. The world is starting to discover what all of us who live outside Tier 1 cities already know – there is so much more to experience! Having grown up in Rochester, NY, about 6 hours west of NYC, it’s hard not to fall for the “small city” complex. The perceptions of what tier 1 or 2 cities can offer are changing and we have creative tourism marketers to thank for it. 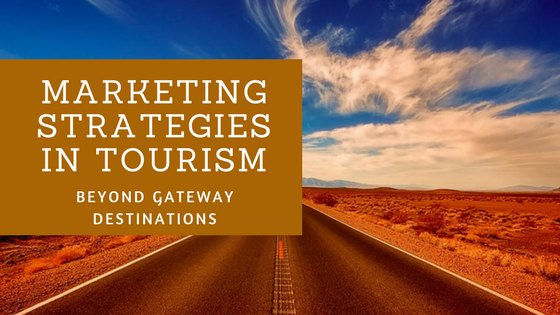 Here are a few creative and collaborative marketing strategies that have worked for beyond gateway destinations that will get your creative juices flowing. The Cayuga County Office of Tourism started this marketing program to package many of the agri-tourism assets that the county has to offer. The program began in 2013 and has grown to 20 stops offering baked goods, jams & jellies, honey, wine, maple syrup, strawberries and many other items to satisfy your sweet-tooth. The program has gained notoriety over the years grabbing attention of many national media outlets, including being named a Top 10 Food Trail by USA Today and 10Best readers. The trail has also been a catalyst for attracting international tourists and motorcoach group tours. Many of the trail locations have seen a positive impact in their business as result of their participation. To learn more about the trail listen to Destination on the Left podcast interview with Cayuga County Tourism Director, Meg Vanek. The Haunted History Trail of NYS launched as a marketing strategy to help lesser-known attractions and historic sites get recognized. The collaborative program includes 33 NYS counties and more than 60 attractions including haunted dining, tours, attractions, events and accommodations. It is the only state-wide paranormal tourism trail in the country. In 2015, the trail received an Excellence in Tourism Marketing Award State-wide by the New York State Tourism Industry Association. According to a recent economic impact study, the trail in 2016 had a direct economic impact over $1.5 million. Moreover, many visitors return to sites along the trail, giving it high repeat visitation. To learn more about the Haunted History Trail of NYS, listen to Destination on the Left podcast interview with Kelly Rapone, Genesee County Tourism Director and trail founder. Read about how Break the Ice Media helped the Haunted History Trail attract more national paranormal fans. This 6-day tour through the top tourism destinations of Northern New York takes visitors through Saratoga County, Ausable Chasm, Lake George, Tupper Lake, and Lake Placid. This program is a collaboration between the Adirondacks and Capital-Saratoga Regions of NYS. They created the program to inspire international visitors arriving in NYC to also explore the northern part of New York State. They established the itinerary and website just in time for the 2017 International Pow Wow convention in Washington DC. Several representatives from the two regions attended the conference representing the Go North program. Initial interest from International Travel Trade has been very positive. To enhance the offering for International Visitors, the regions hosted an educational seminar and workshop for industry stakeholders. The goal was to gain interest and buy-in from a broader mix of lodging, dining and attractions. More than 40 stakeholders attended the 6-hour workshop and work is starting on an enhanced program for 2018. Butler County, Ohio, created the Donut Trail in 2016. They needed to create a tourist attraction for a destination with mostly 2nd and 3rd tier attractions. Another challenge is that they are sandwiched between two large metropolitan areas. Tapping into the culinary tourism trend, the CVB wanted to find a niche to entice visitors to explore local flavors. Through brainstorming and research, the CVB realized that they had more local donut shops per capita than any other destination. With one donut shop for every 17,000 residents and over 90% of shops locally owned, the donut trail was born. During its first 18 months, it drew 7,500 visitors, 125,000 website visits and earned 80 million media impressions. Even more impressive, it provided an economic impact of $950,000 to the county. And then submit your One Big Welcome video!